Where’s your phone, right now? I bet that it’s not more than three feet from you; am I right? And there’s around a 50% chance that you’re even reading this post on your phone. When I reach for my computer to search for something on the internet, around 50% of the time, that computer is my phone. That little rectangle of metal and wizadry, that stays with me all day, in my pocket, on my desk, it goes where I go. And like many of us, I’m completely lost without it. That’s why it makes perfect sense to make sure that as an estate agent, your website is mobile-friendly. A site that loads well on a smartphone, with big buttons and simplified navigation will not only allow visitors to be able to access the information they’re looking for quickly and easily, but also sends out a very strong signal that you are a forward-thinking, innovative company. But what about apps? There are several companies out there trying to convince you that as a 21st century estate agent, an app is absolutely vital to your business, and urge “Don’t get left behind!” For a very modest £30 a month on average, you too could have a fancy app that your customers can download for free, so you’re always only a few clicks away for them. After all, as these app companies tell us, “the way your customers search for property is changing”. It is. It has. Home buyers use Rightmove, Zoopla and Primelocation on their phones around 50% of the time. It’s a massive change from just five years ago, when to browse properties, you were probably using a desktop. But if you were searching for a home in say, Bristol, why would you visit 153 different agents’ sites to browse for property? You wouldn’t, of course, because the portals have made life super-easy for a buyer to browse a near-complete database of the properties in that area. As an agent, you just can’t compete with a Rightmove search on mobile, and why would you want to? They’ve spent millions getting it right, so that buyers can search for properties seamlessly on an iPhone, Android, tablet, or whatever their device of choice is. So if an app isn’t for home buyers, what is it for? It’s for agents. It’s for them to show off, to say “Look at how tech-savvy we are – we even have an app!” At best, it’s an indication that they want to be seen as innovative; at worst, it’s an indulgence: they want that badge of honour on their website that shows their customers – and their competitors – how cutting edge they are. But these app companies are trying to solve a problem that doesn’t exist – making mobile property search easier for the home buyer or tenant. Rightmove already did that; so did Zoopla. You don’t need to re-invent the wheel. You just need to be there. And who is your ‘customer’, anyway? The buyer? Or the seller? If I offered you right now, 100 new purchasers, or 10 new vendors (or landlords) – which would you choose? Over the last year, I’ve asked this of countless groups of estate agents, and unfailingly, they say they need more vendors. There just aren’t enough to go around at the moment. Stock levels are low and agents are canvassing, targeting boards and over-valuing to win the instruction. It’s so 2007. So if agents need more vendors, why do they want a purchaser-focused app? Yes, vendors want their estate agent to work tirelessly on their behalf to sell their property, but do they need an app to convince them that they will do this? I think not. A mobile-responsive website will demonstrate this much more easily, simply and cheaply. Apps can be fun; they can be useful. When I look at my iPhone, I see almost 100 apps, some of which I’ve never used, and some of which I use every day. None of them are estate agent apps. And I’m about to move home. Next post If you can’t beat them…. Great blog and very true! Thanks Andy! I appreciate your support. Great blog post! Within my position I usually get a message every other day across both Facebook & Twitter in regards to developing an app for our agency and often hear the same reasons of ‘property search is changing’ and ‘app usage is higher than mobile usage’ and the best one I’ve heard is ‘it allows a push notification system to get directly on their mobile’ whereas any proactive agent would no doubt agree that the most direct line of contact is, in the the first instance a telephone call! 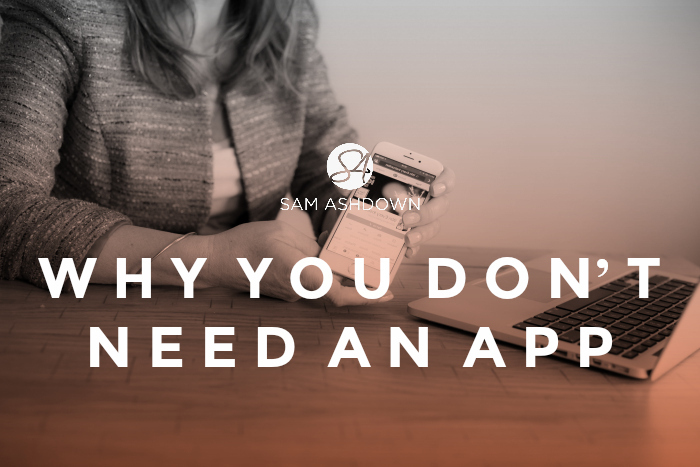 Although I agree that apps are useful, I disagree that an independent agents app would be as you’ve already stated why with Rightmove & Zoopla leading the way. Thanks for a great read Sam! Thank you Dean. Totally agree – we need to speak to vendors, and an app can get in the way of that! We looked at having an App, but I couldn’t convince myself to get one, I don’t believe buyers will download X number of Agents apps when you can have RM or Z who do the job for you, in the area you need. Thanks for your comments James. It’s not an inconsiderable amount, approximately £360 per year. Think what else that could buy you that would engage vendors in a more direct way! This may sound a bit strange as I run a successful App development company (Appware) but I pretty much agree with all of the above. An honest option, shock horror! I can see how that in a few specific cases an App may be a good option (premier customers get push messages ahead of normal users etc) but for most estate agents I just can’t see the benefit for their customers. Just replicating the functionality of a mobile website within an App isn’t really worthwhile. Yes, they may get some PR and be seen to be advanced but does that really help their customers? As has been said above, most customers will be using Rightmove etc and won’t want to install and check all 20 seperate Apps for all their local agents. There is also the issue of having to have their App developed across all the major platforms (iPhone, Android, Windows Phone, Blackberry) to make sure it’s available to all. In my opinion agents would be better off investing in their websites to make them truly mobile friendly and a great experience instead. Richard, I really appreciate your time and effort in writing your comments. Very interesting, when coming from an app developer! It would be much more useful if an app was developed for movers perhaps – packing advice, to-do lists, that kind of thing. Or maybe an app based on my homeseller website, http://www.home-truths.co.uk, which seeks to advise sellers wanting a more effective sales process. The one user that doesn’t need an app is the buyer! With Rightmove, Zoopla and Primelocation (and shortly, Agents’ Mutual), buyers have all the information to search for their next property that they could ever need. This is such a valid article, thank you for pointing out the seemingly obvious point. Critical is a mobile friendly site but as you say the app is an unnecessary addition in a market such as searching for properties. Much better that estate agents spend their money on other aspects of their service I think. Thanks again Sam, very interesting reading. I invested in an app for our independent estate agency because I was told I should have one by people who I thought were “in the know”. Sadly, they were wrong. Subsequently I was told, by the same people, that actually I would be better off investing my money in a mobile version of our website. So I ditched the app and followed their advice. This time they got it right. Next time, however, I shall ask you first, Sam! As ever, a great blog. We have an app but the number of users is relatively low for the reasons you give above (we expected it but felt we needed an app for ‘show’ in any case). We now have an app developer trying to persuade us we need an app which integrates with social media but, having seen their engagement rates, it is an expensive folly for anyone choosing to go down that route. A good agent will make their website and social media presence work for their customers by putting in hard work and their experience of communicating with buyers and tenants. Lazy agents will rely on Rightmove and apps to do their job for them with, unsurprisingly, below average results. Thanks for your kind words Chris! Very interesting to hear from an agent who does actually have an app already. I love your honesty, saying it was ‘for show’! Developer rates certainly aren’t cheap, and you have to question whether it’s actually going to bring you closer to your business goals. You have a great presence on social media and this, I’m sure, brings you far greater quality engagement than any app could ever do. Great comment Chris – many thanks. A really interesting piece Sam, and as previously mentioned by others, a mobile version of a website I would imagine, would be the most cost effective solution in servicing a buyers. If you have a good, dynamic website which includes mobile version of the same, a buyer would have no use for an app. A great “current” talking point. Thanks for sharing! I can’t see the point, or justify any additional costs. If I was looking to buy a property, I’d use a generic listing site, one of those I don’t like to mention! It might ‘buy’ a bit of local press coverage and is something that could possibly be used in trying to obtain an instruction, but I really don’r see it being a deal breaker!! I’ve spoken to various App ‘developers’ over the past 18 months and none of them have managed to persuade me to part with my brass!! I 100% agree with the general comments about apps, but…We got an app! – and the only reason the salesman convinced me was because he talked about it being a channel to my buyers. It lets me ‘push’ messages to them. I list a house this afternoon and the people who have my app get it on their phone straightaway. With properties selling fast in our area, buyers who download the app hear first, before e-mail , web sites the lot. I use it as a listing tool as well as my potential vendors get told I’ll reach hot buyers with their home before anyone else. Hi David, and thank you for your comment. Very interesting to hear from someone who actually has an app, and likes it! Using it as a listing tool is definitely the key; I’d just question whether it’s a bit indirect as an instruction-winning marketing strategy. Thanks for sharing! Great blog post and totally in tune with our thoughts. We toyed with the idea of offering this to our clients but decided against. Unfortunately at a time when estate agents are desperately seeking new vendors, they are more susceptible to new buzz words & technologies that are not fully understood. The industry has changed at a pace that many are finding hard to keep up with and so are easily led. At the end of the day nothing beats a World Class Service and the money is probably better invested in helping your clients find out about yours. Getting through the door is the hardest part, is there an app for that? I can’t see how an app would beat a good mobile site (it’s on my list!) and agree that any methods that allow an agent to communicate the benefits of their services more effectively to would-be vendors would be a wiser investment. Of course I’m thinking of video here (no surprise!). Regular tips for vendors in a short video newsletter or blog would set you apart from your competition, forge lasting relationships and help your web traffic. Another excellent blog. It’s all been said already by other people. It’s great how you just cut through the jibberish of the app companies and get your points across so well. I was canvassed the other day by company selling telephone on hold messages (rather than music) the message was describing listing. They said it was another way potential vendors would see how hard we tried to sell properties. So if was a effectively a listing tool !!! !